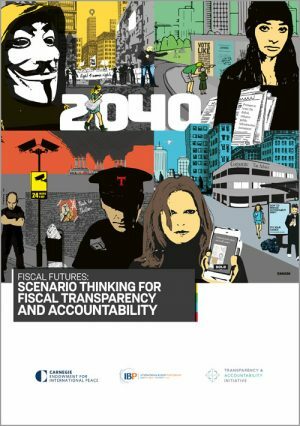 What will public finance look like in the year 2040? The Fiscal Futures planning workshops, convened by the International Budget Partnership, the Transparency and Accountability Initiative, and the Carnegie Endowment for International Peace in the spring of 2018 brought together 35 key actors from 14 countries under the theme of Fiscal Futures to review assumptions, rethink strategies, and imagine the future of public finance two decades from now. During the workshops, participants used a scenario building methodology to envision public finance in the year 2040. The four stories presented in this booklet are the results of that creative process. They are centered on the interplay of two main variables: democratic governance and civic engagement. Each of the stories compresses these and a handful of secondary drivers — among them technology, corporate power, climate change and environmental degradation, and shifting media landscapes — into plausible and relevant futures with different public finance implications. The four scenarios illustrate the crucial role of public finance systems and policies in advancing — or undermining — economic equality, social justice, sustainable development, and human rights. Organizations can draw on the scenarios and apply them to their own context. We hope that these stories offer inspiration that will stimulate a field-wide dialogue, especially among national, regional, and international civil society organizations, about long-term strategies for advancing fiscal transparency and accountability.